Blood pressure measurement. High blood pressure usually has no symptoms. 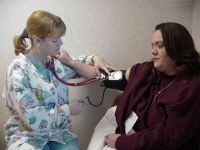 The only way to tell whether you have high blood pressure is to perform a quick, painless measurement using a device called a sphygmomanometer. This instrument consists of a gauge and a rubber cuff that's placed around your arm or leg and inflated. The doctor or nurse uses a stethoscope to listen for the appearance and disappearance of sound produced by the pulse in your elbow region. That's how the systolic and diastolic blood pressures are determined. A 12-lead electrocardiogram (ECG) of a person with high blood pressure. It shows evidence of left ventricular hypertrophy (LVH or enlargement of the heart).